Una interessant recerca del meu germà. He mecanografiat a mà jo mateix tot el text del llibre. Seria genial que ho divulguessis a tothom. Estava acabant el genial llibre de Brian J. Ford “Armas Secretas…” (t’ho poso més avall) quan vaig anar a parar al capítol “Secretos electrónicos”, punt “Enigma, ficciones y hechos”. El llibre està escrit de forma molt amena, com de divulgació, però el to no té desperdici i, tot i que té alguns errors (pocs), està molt ben documentat. Si t’interessa, te’l puc deixar perquè ja me l’he polit. Vaig al gra. El tema d’Alan Turing, com qualsevol tema que surti en una pel·lícula de Hollywood o de l’equivalent anglès o de qualsevol país, s’ha d’agafar amb pinces. Ja no em refereixo als error de pel·lícules típics que surten als webs, sinó a manipular la història i a encarregar-se que tota una generació veneri mentides. Doncs bé, sense ànims de treure importància a la figura del genial matemàtic, criptògraf i moltes altres coses (falten adjectius), val a dir que 2 de les seves majors contribucions són falses. El diseño de la máquina Enigma se actualitzaba regularmente a fin de añadir más niveles de complejidad, y el número de posibles combinaciones que el descifrador tenía que probar se fue volviendo imposible de manejar. Se necesitaba un sistema mejor. Por eso, en el otoño de 1938 Rejewski diseñó su primer sistema descifrador, conocido por los aliados como la Bomba. En un principio tenía la potencia de seis máquinas Enigma trabajando simultánemanete, y permitía a un solo criptógrafo hacer el trabado de cien. En un año había seis Bombas trabajando en la estación descifradora de Varsovia. Significaba que una habitación contenía máquinas descifradoras que hacían el trabajo de 600 personas muy entrenadas. Pots continuar llegint… et passo les pàgines més interesssants escanejades. Considered a “father of the computer“, Babbage is credited with inventing the first mechanical computer that eventually led to more complex designs. His varied work in other fields has led him to be described as “pre-eminent” among the many polymaths of his century. Babbage began in 1822 with what he called the difference engine, made to compute values of polynomial functions. It was created to calculate a series of values automatically. By using the method of finite differences, it was possible to avoid the need for multiplication and division. For a prototype difference engine, Babbage brought in Joseph Clement to implement the design, in 1823. Clement worked to high standards, but his machine tools were particularly elaborate. Under the standard terms of business of the time, he could charge for their construction, and would also own them. He and Babbage fell out over costs around 1831. Some parts of the prototype survive in the Museum of the History of Science, Oxford. 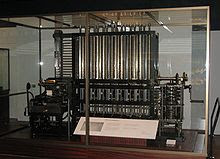 This prototype evolved into the “first difference engine.” It remained unfinished and the finished portion is located at the Science Museum in London. This first difference engine would have been composed of around 25,000 parts, weigh fifteen tons (13,600 kg), and would have been 8 ft (2.4 m) tall. Although Babbage received ample funding for the project, it was never completed. 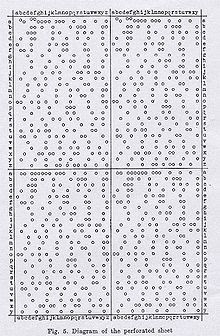 He later (1847–1849) produced detailed drawings for an improved version,”Difference Engine No. 2″, but did not receive funding from the British government. His design was finally constructed in 1989–1991, using his plans and 19th century manufacturing tolerances. It performed its first calculation at the London Science Museum, returning results to 31 digits. Nine years later, the Science Museum completed the printer Babbage had designed for the difference engine. Zuse was also noted for the S2 computing machine, considered the first process-controlled computer. He founded one of the earliest computer businesses in 1941, producing the Z4, which became the world’s first commercial computer. From 1943 to 1945 he designed the first high-level programming language, Plankalkül. Zuse completed his work entirely independently of other leading computer scientists and mathematicians of his day. Between 1936 and 1945, he was in near-total intellectual isolation. In 1939, Zuse was called to military service, where he was given the resources to ultimately build the Z2. In September 1940 Zuse presented the Z2, covering several rooms in the parental flat, to experts of the Deutsche Versuchsanstalt für Luftfahrt (DVL; i.e. German Research Institute for Aviation). The Z2 was a revised version of the Z1 using telephone relays. The DVL granted research subsidies so that in 1941 Zuse started a company, Zuse Apparatebau (Zuse Apparatus Construction), to manufacture his machines, renting a workshop on the opposite side in Methfesselstraße 7 and stretching through the block to Belle-Alliance Straße 29 (renamed and renumbered as Mehringdamm 84 in 1947). Improving on the basic Z2 machine, he built the Z3 in 1941. On 12 May 1941 Zuse presented the Z3, built in his workshop, to the public. The Z3 was a binary 22-bit floating point calculator featuring programmability with loops but without conditional jumps, with memory and a calculation unit based on telephone relays. The telephone relays used in his machines were largely collected from discarded stock. Despite the absence of conditional jumps, the Z3 was a Turing complete computer. However, Turing-completeness was never considered by Zuse (who had practical applications in mind) and only demonstrated in 1998 (see History of computing hardware). 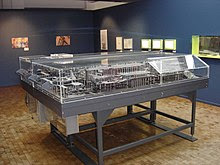 The Z3, the first fully operational electromechanical computer, was partially financed by German government-supported DVL, which wanted their extensive calculations automated. A request by his co-worker Helmut Schreyer—who had helped Zuse build the Z3 prototype in 1938—for government funding for an electronic successor to the Z3 was denied as “strategically unimportant”. Although all Bomby were destroyed in 1939, just before the Germans invaded Poland, Rejewski made a sketch many years later, which appears in The Secret War in 1978 . In 1979, an improved version of this sketch appeared in a report by Marian Rejewski . It is shown on the right. The machine is based on the principle that the 3-letter message key is sent twice at the beginning of each message and that a particular plaintext letter, might yield the same ciphertext 3 positions apart. E.g. AWB TWY. Such coincidences were called Females. As both letter groups (AWB and TWY) originate from the same plaintext, it is possible to search for that unique combination. If enough females were found, the Bomba could be used to find the Ringstellung. The initial wheel positions (Grundstelling) was already given in clear in the preamble of the message. As the Germans used just 3 Enigma wheels at the time (I, II and III), there were 6 possible wheels orders that had to be investigated. This was done by running 6 Bomby in parallel. 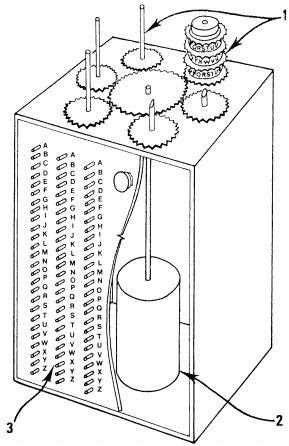 Each Bomba had 6 complete Enigma rotor-sets at its top surface (1). These were connected in pairs. Each pair was used to solve one (of three) females. Although the exact operation of the Bomba is still unknown, many have tried to explain its principle by reconstructing a theoretical model. The best attempt so far is described by David Link in Cryptologia in 2009 .